Rachael, R.P., et al. A Unique Case of Lemierre’s Syndrome in a patient with Otitis Media. (2016) J Anesth Surg 3(1): 128-130. © 2016 Rachael, R.P. This is an Open access article distributed under the terms of Creative Commons Attribution 4.0 International License. We present the case of a 19 year male who presented initially with acute otitis media and mastoiditis that subsequently evolved into Lemierre’s syndrome. The diagnosis was made 5 days after admission when the patient continued to show no clinical improvement despite IV antibiotic therapy. The only isolate was from blood cultures that grew Fusobacterium necrophorum. The patient was appropriately treated and made a full recovery from this syndrome. 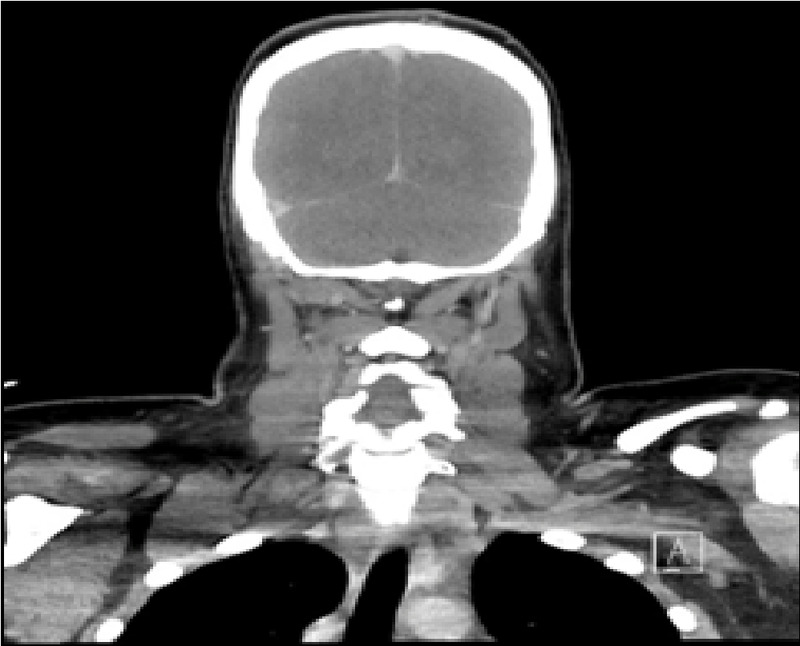 This case shows the importance of making the correct diagnosis and subsequentappropriate treatment to prevent the serious morbidity and mortality associated with Lemierre’s syndrome. This was particularly important in this case as the antibiotic therapy for Fusobacterium necrophorum is very different to the usual treatment modalities for pharyngitis and otitis media, and if not detected early could have lead to serious and life-threatening complications for the patient. Lemierre’s syndrome, also known as postanginal septicemia, was first described in 1939 by Andre Lemierre. It refers to septic thrombophlebitis of the ipsilateral internal jugular vein most commonly seen after a recent oropharyngeal infection. The resulting purulent thrombophlebitis may be complicated by septic emboli whichcan disseminate to multiple sites distant from the pharynx. It generally occurs in healthy adolescents and young adults and is most often caused by anaerobic bacteria, the most common of which is Fusobacterium necrophorum. The most common initial clinical presentation is a sore throat, followed by a neck mass or neck pain. The diagnosis is made from clinical and/or radiological evidence of internal jugular vein thrombosis and isolation of anaerobic pathogens. Before the era of antibiotics, Lemierre’s syndrome was often fatal with a mortality rate of up to 90%. However its incidence fell dramatically with the introduction of antibiotics for the treatment of streptococcal pharyngitis. Since the advent of antibiotic therapy Lemierre’s syndrome was thought to be the forgotten disease. However the incidence of this disease has been slowly increasing over the last 10 - 15 years suggesting that it might not be as rare as once thought. We report the case of Lemierre’s syndrome in an adolescent who developed a clinical illness out of proportion with his original diagnosis of otitis media. A 19 year old moderately obese male with a background history of multiple grommets and persistent right otitis externa over the last year presented with sepsis to the emergency department of the gold coast university hospital. He had a 2 week preceding history of right ear pain, otorrhea and fevers. He had no known drug allergies and was not taking any medication at the time of admission. On examination he was febrile to 39.9, tachycardic with a HR of 139 and BP of 100/78. He was alert and orientated to person, place and time. WCC was 20.8 and CRP 258. Otoscopy showed discharge in the external auditory canalwith a small anterior tympanic membrane perforation. He had a tender mastoid with no mastoid swelling. Computer Topography (CT) showed fluid in the mastoid air cells with a partially opacified middle ear cavity (Figure 1). He was initially thought to have a right otitis media with early mastoiditis and was commenced on IV Piperacillin Tazobactum and ciproxinear drops. He remained tachycardic with spiking temperatures over the next few days with an evolving post-auricular abscess. A CT neck on day 5 post admission showed evidence of a Bezold’s abscess (spread of the infection through the medial aspect of the mastoid tip into the sheath of the sternocleidomastoid muscle) with a filling defect along the course of the right internal jugular vein (IJV) suggestive of Lemierre’s syndrome(Figure 2). He underwent incision and drainage of the abscess that day with insertion of a grommet into the right tympanic membrane. He was commenced on IV Vancomycin after consultation with the infection diseases team. The decision was made not to commence him on any anticoagulation. The intraoperative pus swab grew no organisms but his blood cultures a few days later grew fusobacterium necrophorum and he was subsequently changed to IV Timentin. Even though his inflammatory markers started to improve, he remained febrile and tachycardic and only began to show signs of clinical improvement ~7 days post op. On advice from the infectious diseases team he was given 3 weeks of IV Timentin followed by a 3 week course of oral Amoxicillin and Clavulanic acid and was asymptomatic and well 6 months after discharge with no residual effects. Fusobacterium necrophorum is responsible for the majority of the anaerobic bacteremia seen in Lemierre’s syndrome. Other miscellaneous gram-negative anaerobes as well as anaerobic streptococci have been implicated in the cause of this disease. The oropharynx is the most common source of infection in Lemierre’s syndrome and, to my knowledge, there have only been sixother cases reported of Lemierre’s syndrome occurring secondary to otitis media/mastoiditis. Two of these were in pre-adolescent children, and one was in a middle aged male[2-4]. Giridharan et al report an additional 3 cases of mastoiditis that resulted in Lemierre’s syndrome in 2 infant and one pre-school child. Septic spread of otitis media usually involves preschool children, and most commonly results in meningitis rather than internal jugular venous thrombophlebitis. Other extra pharyngeal sources such as lungs, teeth and sinuses have also been described. Septic emboli following the internal jugular thrombophlebitis have been seen to occur in over 63% of patients, with metastatic infection being seen in a range of sites including the liver, muscle, pericardium, lungs, joints, brain and skin. Treatment involves aggressive and prolonged antibiotic therapy, sometimes in combination with surgical treatment to drain the collection of pus depending on its location. The choice of antibiotic is determined by in vitro sensitivities and clinical evidence and is often instigated in consultation with a microbiologist. The use of anticoagulation remains controversial as there are no randomized control studies to test the benefits of its use in patients with Lemierre’s syndrome. Some authors recommend anticoagulation only if the thrombosis extends into the cavernous sinuses or if there is no improvement in symptoms with antibiotic therapy alone. 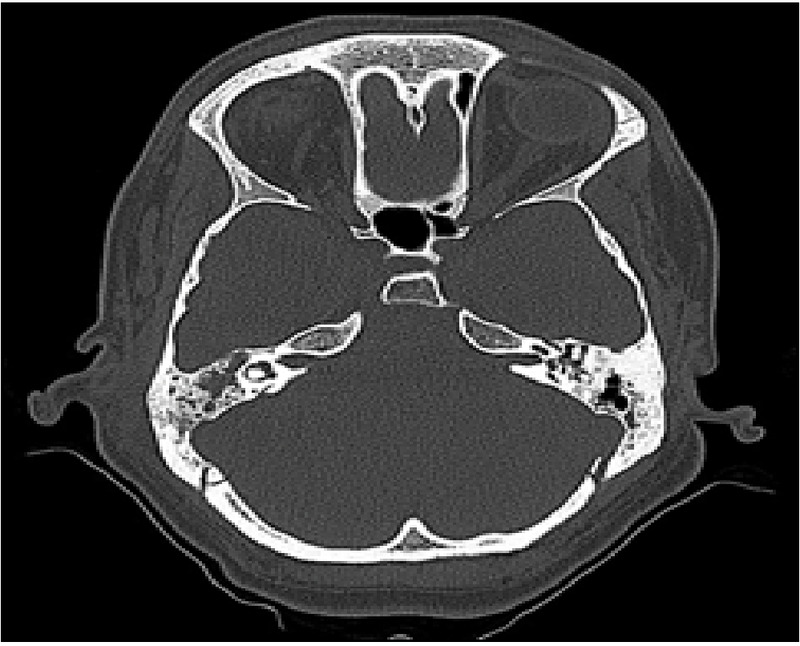 This case highlights the importance of early diagnosis and treatment of Lemierre’s syndrome to prevent serious fatal progression in what was originally thought to be a routine case of otitis media. It remains imperative that clinicians have a high index of suspicion for this condition with any patient presenting with head and neck infections, as a delay in diagnosis can be associated with a high mortality rate. 1. Lemierre, A. On certain septicemias due to anaerobic organisms. (1936) Lancet 1(5874): 701-703. 2. Lopez, L.R., Dominguez, F.R, Paul,e P.N., et al. [Lemierre’s Syndrome. An unsual variant]. (2007) Acta Otorrinolaringol Esp 58(5): 217-218. 3. Harris, C.M., Johnikin, M., Rhodes, M., et al. Lemierre’s syndrome resulting from streptococcal induced otitis media and mastoiditis: a case report. (2009) J Med Case Rep 3: 6658. 4. Turan, A., Cam, H., Dadali, Y., et al. A Case of Lemierre Syndrome secondary to otitis media and mastoiditis. (2014) Case Rep Emerg Med 208960. 5. Giridharan, W., Osman, E.Z., Amma, L., et al. Complicated otitis media caused by Fusobacterium necrophorum. (2004) J Laryngol Otol 118(1): 50-53. 6. Le Monnier, A., Jamet, A., Carbonnelle, E., et al. Fusobacterium necrophorum middle ear infections in children and related complications: report of 25 cases and literature review. (2008) Pediatr Infect Dis J 27(7): 613-617. 7. Eilbert, W., Singla, N. Lemierre’s syndrome. (2013) Int J Emerg Med 6(1): 40. 8. Hagelskjaer, L.H., Prag, J. Human necrobacillosis, with emphasis on Lemierre’s syndrome. (2000) Clin Infect Dis 31(2): 524-532.